Clinton’s latest statement is not the first time she’s denied any interest in running against Obama. Every time the story begins to fade, however, another news item surfaces to reignite discussion of a Clinton candidacy. The latest triggering event, as highlighted in this Politico story, is a recent Bloomberg news poll that received heavy media play for its finding that 34% of respondents thought the country would be better off if Hillary Clinton had been elected president. (The poll was in the field Sept. 9-12, and has a margin of error of +/- 3%). That is an increase of 9% from when this question was asked by Bloomberg in 2010. Interestingly, even though majorities of both groups view her unfavorably, Republicans and Tea Party supporters were more likely to say the country would be better off under Clinton than were Democrats; most Democrats believe things would be no different under a Clinton presidency than it has been under Obama. That same poll found that she is easily the most popular figure among a list of prominent political figures that includes all the leading Republican candidates for president as well as President Obama. 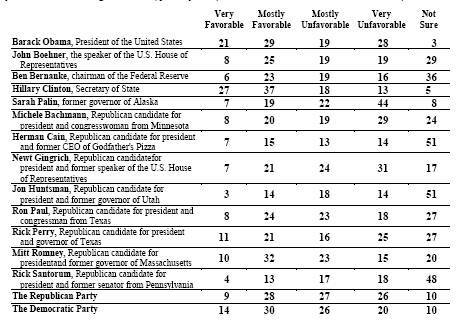 As the following table shows, 64% view her “very” or “mostly favorably”, putting her comfortably ahead of President Obama, the second most favorably viewed person and far ahead of any Republican. This survey reinforces a point I have made before: that (and contrary to Nate Silver’s assertion) Clinton would likely run more strongly than Obama in the general election but would have a very difficult time beating him for the party’s nomination. Given this, I have no doubt that her supporters will continue to promote her candidacy, and that these types of triggering events, whether polling data or pundits’ comments, will continue to keep this story in the news. And, in fairness to those who push this story, in any “normal” election cycle, as I’ve discussed here, Obama would be facing a primary challenge. The fact that Clinton won’t challenge him, however, reminds me that perhaps Obama’s single best political move to date was nominating her to be his Secretary of State. In November, 2008, I wrote a blog post advising Obama not to make this offer to Clinton, and advising her not to take the position if offered. My advice was correct for Clinton – but wrong for Obama. In fact, given his current political vulnerability, appointing Clinton as Secretary of State now seems like a stroke of pure genius. If there is one factor that makes it difficult for her to enter the race, it’s that she’s a visible member of his administration – probably the most visible. Given her public status, severing ties at this point in order to challenge Obama would, I think, pose a formidable psychological hurdle, never mind the political ramifications that many of you have cited in response to my previous posts on this topic. Consider, however, if Clinton had followed my advice in 2008, and remained in the Senate. From there it would have been much easier to act as a “shadow” president, and to position herself to challenge for the party’s nomination should Obama become vulnerable, as he has. As I said in my first post on this subject, however, that won’t happen. Obama will be the Democratic standard-bearer and Clinton will likely serve out her term and step down no matter what the 2012 outcome. Supporters will undoubtedly then urge her to run in 2016. In the CNN interview, she didn’t quite close the door to a return to politics. Whether she wants to put herself through that grueling process again, at that point in her life, remains to be seen. First France. Now Canada. The “draft Hillary” campaign that I am now accused of sparking is apparently gaining traction in all the places where no one can vote for her. Evidently that’s the kind of influence I have – a pariah at home, prophet abroad. Yesterday, I appeared on the Arlene Bynon Show, a Toronto-based radio talk show, to discuss the “growing draft Hillary movement”. (Note that the audio link is listed under Monday, August 16. Must be based on the Canadian calendar!) In that interview, she asked a very interesting question: what would it take to persuade Hillary to jump into the race? I should begin by reminding everyone that I don’t think that she will get into the race, nor am I personally advocating a Clinton challenge. (For those who haven’t figured it out yet, I’m an analyst, not a partisan advocate.) The original post that started all this was based on conversations with Democrats, many of whom were making the argument that she should run. In that post I tried to lay out the scenario that would justify that decision. The primary one, as I discussed with Bynon, is the calculation that Obama can’t win in 2012, and that she would have a better chance of keeping the White House in Democrat’s hands. We can (and have) debated whether that is true. But Bynon’s question got me thinking: what would be the logistical hurdles a Clinton challenge must overcome? In contemplating this question, it becomes immediately clear that she faces complications that previous intra-party challengers to incumbent presidents did not. To begin, she is part of Obama’s administration. When Ted Kennedy challenged Jimmy Carter in 1980, he was a sitting Senator and sometime administration critic. Four years earlier, Ronald Reagan was an ex-Governor with national stature but no official public position when he took on the “accidental president” Gerald Ford. In 1992, Pat Buchanan was a media personality with a reputation for “pitchfork” American-first politics at odds with President George H. W. Bush’s more internationalist “new world order” foreign policy. If we go back further, to 1968, both Eugene McCarthy and Robert Kennedy were senators who turned against the Vietnam War when they launched their bids for the presidency held by Lyndon Johnson. As Secretary of State, Clinton faces a different challenge. Presumably launching a candidacy would involve a two-step process – resigning from Obama’s administration and announcing she was taking him on. Taking the first step would generate immediate speculation about the second, so she would in all likelihood combine them both into a single media bombshell announcement. “I am stepping down today to announce…” In that speech she would have to explain why, as a member of the Obama team, loyalty demanded that she not express the deep dissatisfaction that was now fueling her run. Could she pull off this delicate political pivot? Jon Huntsman has had to perform a similar two-step, with results still pending. If Clinton is truly committed to running, I don’t think this additional complication would be an impediment to winning, although some opponents would certainly cite it as a form of political “backstabbing.” But my guess is it wouldn’t cost her the votes of people who would otherwise be inclined to support her. One reader laid out another factor that might be necessary for Clinton to run: a Democratic stalking horse. If another Democrat launched a bid against Obama – say a Kucinich, or Feingold – that might provide political cover for Clinton to jump in. A similar dynamic drove RFK’s decision in 1968; he formally entered only after McCarthy’s second-place finish to LBJ in the NH primary demonstrated that the President was vulnerable. There is also the timing issue. When would Clinton have to announce? Reagan, Kennedy and Buchanan all launched their bids about a year before the general election: Reagan in November 1975, Kennedy in November, 1979 and Buchanan in December, 1991. That gave them 10-15 weeks to gear up for the New Hampshire primary. In contrast, under the pre-primary, convention-dominated nomination process, Robert Kennedy could afford to wait much longer before entering the 1968 race, since he was courting party leaders who controlled blocs of delegates more than issue activists that voted in primaries. Given the front-loading of the current nomination process, and the need to put together a funding infrastructure, I would guess Clinton would have to declare at least as early as did Reagan, Ted Kennedy or Buchanan – that is, no later than December, 2011. So, what would it take for Clinton to run? Here’s the hypothetical scenario. Sometime in the next two months, a progressive Democrat needs to jump into the race, perhaps emboldened by a drop in Obama’s approval ratings into the mid-30% level. Meanwhile, despite the President’s nationwide September “jobs” speech, third-quarter employment figures come back showing little-to-no job growth. Then the joint budget committee releases a deficit reduction plan that calls for deep spending cuts, including entitlement reform based in part on pushing back eligibility dates which are interpreted by the Democratic Left as de facto benefit cuts. Meanwhile, Syria and Libya continue to burn, while a rise in violence in Iraq leads the government there to petition for an extension of the U.S. military presence. These events don’t need to unfold exactly like this, or in this exact sequence, but you get the picture. Would this convince Clinton to throw her pantsuit into the ring? I doubt it. But evidently what I think no longer matters (if it ever did) – the “Draft Hillary” movement has gone international! Will the U.S. be next? Stay tuned, and keep those comments coming. What’s in it for Clinton? I understand the upside for the President. Right now – and no one can project how things will look a year from now – but right now I would put his odds at winning reelection at less than 50%. In the wake of the debt deal, continued volatility in the stock market, and the hammering he took in the Republican debate in Iowa, his approval ratings have fallen 10% since June to about 40%, the lowest of his presidency, and they could very well go lower. No president has won reelection with approval ratings this low. In contrast, Hillary has seen her popularity climb above 60% after almost three years as Obama’s Secretary of State. By putting Clinton on the ticket, Obama supporters hope that he might benefit on the campaign trail from her higher approval ratings, particularly among key constituencies, including older women and white working class voters among which his support his weak. Moreover, the argument goes, she is more likely than Obama to attract independent voters. If we look at the electoral map there’s roughly a dozen states totaling some 155 electoral votes that will likely be in play in 2012. Among them are the big three of Ohio, Pennsylvania and Florida – all states in which Clinton bested Obama in 2008, and in which his popularity lags today. Again, it’s possible that her stronger support in these states among independents and working class voters might bolster his electoral chances. Finally, Clinton would “neutralize” the gender issue should the Republican nominee be Palin or Bachmann, or if either of those two women were on the Republican ticket as the vice president. And she would easily best them in a V.P. candidate debate. But even if we buy these arguments – and longtime readers know that I am skeptical that vice presidential choices have much electoral impact – I still see no upside for Clinton. Obama supporters say it will put her in line to make a run for the presidency in 2016. But she’s already at the top of the Democrat candidate list – why would serving as Obama’s “lady in waiting” for four years bolster her political profile? And that assumes Obama wins reelection. If he loses, after she dives into the political mud on his behalf in a failed political campaign, she could emerge considerably weaker. And she has to then defeat an incumbent Republican. It seems to me that the Hillary-for-VP argument is being driven by Obama’s interests, not hers. Indeed, if the argument that her presence would strengthen the Democratic ticket is as strong as Obama’s supporters claim it is, it leads inevitably to one conclusion: she should be heading that ticket. And the only way to do that is if Obama steps down – or if she challenges him for the Democratic nomination. But, I already said that. The reaction to my last post, (cross listed here at Salon) was a replay of the 2008 primary Democratic primary battle; closely fought, with passions running deep on both sides. Strong cases were made both for and against my argument, made in the guise of a generic Democrat, that Hillary Clinton should challenge President Obama in 2012. Boiling down the comments to their essence, supporters of a Clinton run make two essential points: First, Obama is in electoral trouble, and Clinton will likely run stronger in the general election, particularly among independents. Second, Obama has had his shot, and the results just haven’t been good. It’s time for change. Those opposing a Hillary run think it will divide the party, thus weakening whoever gets the Democratic nomination, and that it will likely cost Democrats a significant chunk of African-American support. More generally, they don’t think his record merits a nomination challenge. Just to clarify, I should make clear that I’m not necessarily advocating the Clinton run – I’m merely making the case that I know many Democrats believe to be true: that the party is in deep trouble if Obama wins the nomination in 2012, and that Clinton is the best alternative. My goal was to get people (including Hillary) to think about it. Clearly I succeeded (well, I haven’t heard from the Secretary as yet). There’s been a lot of debate about this on other websites as well. The always useful and interesting Jon Bernstein weighed in at his plainblog political site in opposition to my argument. Jon claims that, “a challenge from Clinton would be a complete disaster, both for her and for the Democrats.” His post builds on an earlier one he wrote that made the argument that had Clinton won the presidency in 2008, it’s not clear she would have done any better than Obama. Jon’s case against a Clinton challenge in 2012 rests on a point that lots of my readers have made: it would infuriate Democrats, and that she wouldn’t do any better than Obama. I think the first point is exactly right, and I think Jon could have gone even further to point out, that despite the vocal reaction among progressives against the recent debt deal, it actually got stronger support, according to Gallup, among Democrats and Liberals than independents or Republicans. In short, Obama retains strong support among the party faithful, progressives’ protests against the debt deal notwithstanding Moreover, Jon notes, as did many readers, that previous primary challenges in the modern, post-1968 nomination era – by Reagan in 1976, Kennedy in 1980, and Buchanan in 1992, all failed. Why should Clinton do any better? Jon concludes, with a sentence that I confess I don’t understand, by writing: “Basically, it’s pretty simple: if Barack Obama is unpopular enough that he’s vulnerable for nomination, then the nomination isn’t worth very much.” I’m guessing that means that if Obama loses the nomination, whoever wins it can’t win the general election? If that’s what Jon means, I disagree. In any case, here’s the response I would make if I was a Clinton Democrat: .Look again at that Gallup poll – it’s not good news for Obama’s reelection chances. Sure, the deal is viewed favorably by Democrats, but independents hate it – and that’s the group Obama was targeting when he made the deal. So far, and these are only initial results, the payoff doesn’t seem to be high. And to compare Clinton to these previous challengers ignores 2008. She’s not an upstart – she’s someone who already lays claim to substantial support within the party, and who fought Obama to a nomination draw. Do you think after the last three plus years in office Obama is now a stronger candidate, and that she’s weaker? Nor do I think she’d find it difficult to make the case for a nomination challenge. People are digging too deep, I think, if they are trying to parse Clinton’s motivations in running. This isn’t a case of “What’s in it for her?” Nor is it, contrary to Jon’s claim, a run that would be based solely on Clinton’s “resume” (which, by the way, I think matches up far better to Obama’s than Jon does; Obama’s not just president – he’s president at a time when things are not going well on his watch. Not sure that bolsters the ‘ol c.v.) In short, Clinton’s challenge would be justified by the quite reasonable calculation that Obama is going to lose in 2012. How do we know Clinton would do better? We don’t, but there’s case to be made that, in a general election race, although Clinton may lose a chunk of African-American support, she would more than compensate by running stronger among independents and – if a different type of identify politics comes into play – among older women too. In short, this is an empirical question – one that Clinton would undoubtedly try to answer before throwing her hat in the ring. And she would still have to convince Democrats to swallow their misgivings and look at the party’s broader interest in retaining the presidency. But the bottom line is that she probably won’t do worse, and she might do better. I would make a final point – there seems to be an underlying sentiment among some of those opposing a Clinton challenge that it is somehow demeaning to the President. The implicit suggestion is that he is owed the Democrat nomination for a second term, and to challenge that is to show disrespect. I confess that I can’t understand this logic – indeed, this runs against the grain of American presidential politics, which are premised on the idea that presidents preside with the consent of the governed, and when they lose that consent, we throw the bums out. Heck, we have a deep and honorable history of doing just that. I don’t see why Obama should be the exception! Anyway, that’s the response I think a Hillary supporter would make. I’m pretty sure it won’t convince Jon, or many Obama supporters. Nor do I think Clinton is going to run – or even that she should. But if she did, she’d join a long line of candidates who challenged their party’s incumbent president. And that’s how it should be: presidents aren’t handed the nomination for a second term – they have to earn it. Here I disagree with Jon: a party challenge would be good for Democrats, and for the nation.